In an ever-competitive business climate, how can organizations become ever more excellent? If you follow closely the usual best-practices, you’re likely to discover fundamental dilemmas. So, what’s a business leader to do? In a word, “adapt”. While there are many best practices highlighted in the book, it’s clear that one size doesn’t fit all. You need to clearly know your existing business culture and be willing to experiment to identify the right mix of techniques for your business today. The authors (Robert Sutton and Huggy Rao) give lots of examples of modern companies who have struggled with these same issues and picked a mix that’s right for them. Spread a mindset, not just a footprint. Rather than dictate what you want others to do, help them to see (and share) what you believe. Engage all the senses. What isn’t immediately obvious may have profound implications. Link short-term realities to long-term dreams. This is the heart of strategy, making every step of your journey take you closer to your intended destination. Accelerate accountability. To move an organization requires not just a single leader, it requires group cooperation. Cooperation happens when people are empowered and accountable for their actions. Fear the clusterfug. Planning for the worst is long-term smart planning. Scaling requires both addition and subtraction. To scale up an initiative sometimes comes at the cost of something else. You can’t do everything at once. Slow down to scale faster – and better – down the road. A strong foundation allows for better growth. Hot causes, cool solutions. By clearly articulating the “pain point” you can create opportunities to emotionally address the problem (logic alone won’t do it). Cut cognitive load. We often think more is better. But more is simply more. And too much information induces paralysis. Carefully isolate the key issues to allow attention to focus where it belongs. Build organizations where “I Own the Place and the Place Owns Me”. Simply trying to make everyone a superstar performer isn’t sustainable long-term. Better is to create a culture of reciprocity – where the workers are truly empowered to do what’s right. Connect people to cascade excellence. Rather than trying to change an organization all at once, build a domino chain instead. Teach a group your message. Once they’ve embodied it, let the group become the teachers (and repeat). Each group will adapt the changes to their needs, and then pass along a more effective system. Bad is stronger than good. 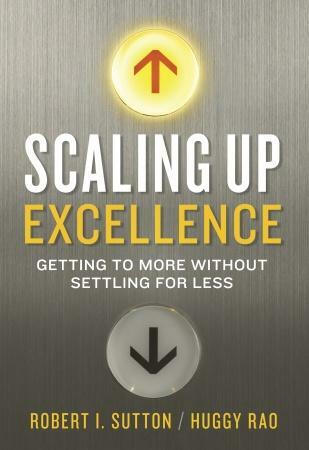 In a field of excellence, what’s noticed is the outlier – the bad thing. Paying attention to the details will allow the big excellence picture to grow organically and sustainably. Interesting thoughts in your review…Perhaps the most valuable principle I’ve learned for anyone who is marketing or selling anything — and that’s all of us — is to answer the question that a customer or client asks: “Why should I buy your product or service instead of someone else’s?” What would be YOUR reason?